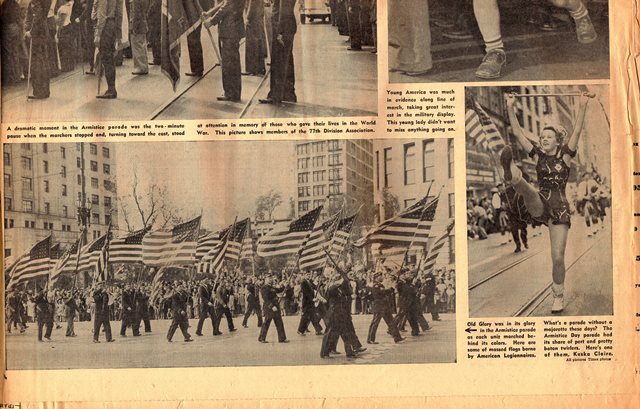 “In the most solemn, purposeful procession to thread the canyon of Broadway in a generation, 15,000 veterans of the World war yesterday marched, with their auxiliaries, in the 23rd annual Armistice Day parade. Solemn, for the truce that was signed in the Forest of Compiegne 23 years ago was frittered away at the peace conference table, and the nations of Europe and Asia are again struggling the bloody clutch of Mars. Purposeful, for yesterday’s was the anniversary not only of armistice but victory – victory over a German warlord who in his heyday was a dread and fearful foe of peaceful men, many of who believed him invincible. 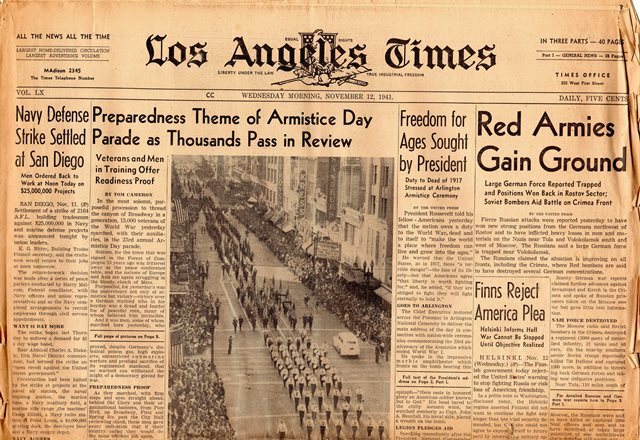 On November 11, 1941, Los Angeles gathered to mark Armistice Day, with a parade through her streets, to honor the veterans of the World War. In less than a month the nation will enter World War II, but at that moment, they are stopping to remember the Great War. 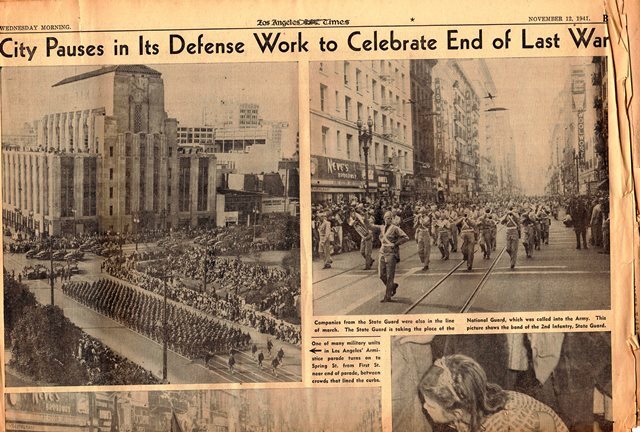 With little exception, the first part of the paper is dedicated to coverage of the parade and news from around the world, regarding what they already perceive as impending doom. As we, in 2018, prepare to mark Veterans Day, on the eleventh hour of the eleventh day of the eleventh month; on the one hundred anniversary of Armistices Day, I urge us all to take a look back, at not only our veterans sacrifice but how those who came before us stopped to remember. We thank you for you service; may God bless you and may God bless America, always. This entry was posted on November 11, 2018 at 11:00 am and is filed under Holiday's, SlideShow. You can follow any responses to this entry through the RSS 2.0 feed.